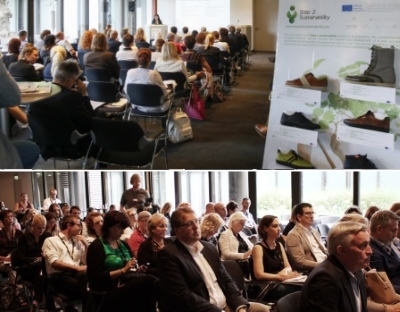 The conference "Green Shoes for a Sustainable Life" was attended by dozens of players of the footwear industry from several countries, and included businessmen, technicians, media, universities, associations and other entities. The Step to Sustainability project was set to create, develop and pilot a new occupation and qualification profile and the correspondent training course on sustainable manufacturing in footwear in order to take advantage of the opportunities coming from a successful implementation of a sustainable strategy. Kirstin Deutelmoser, Director of GDS and it Tag! Welcomed the session and presented a small reflection about sustainability in the footwear sector. She was followed by Carmen Arias, General Secretary of the European Confederation of the Footwear Industry (CEC) with opening remarks, and giving the motto to begin the debate about sustainable footwear production , a topic of common interest to all footwear producing countries. In addition to presenting the results of the project Step to Sustainability, made by Rita Souto, Responsible for the training activities at CTCP - Portuguese Footwear Technological Centrer, participants in the workshop also had the opportunity listen to the case studies of representatives from companies focusing on sustainability as a guiding pilar of their strategy. Beat Brands, Deichmann, Zumnorde, Avocado Store GmbH, Klaveness Footwear, LeatherNaturally shared their stories with all present. The workshop closed with a debate moderated by Helge Neumann, Editor Schuhkurier and participants were able to present their questions to the speakers. For more information about the Step to Sustainability please refer to the project's website.